"I need to make that." 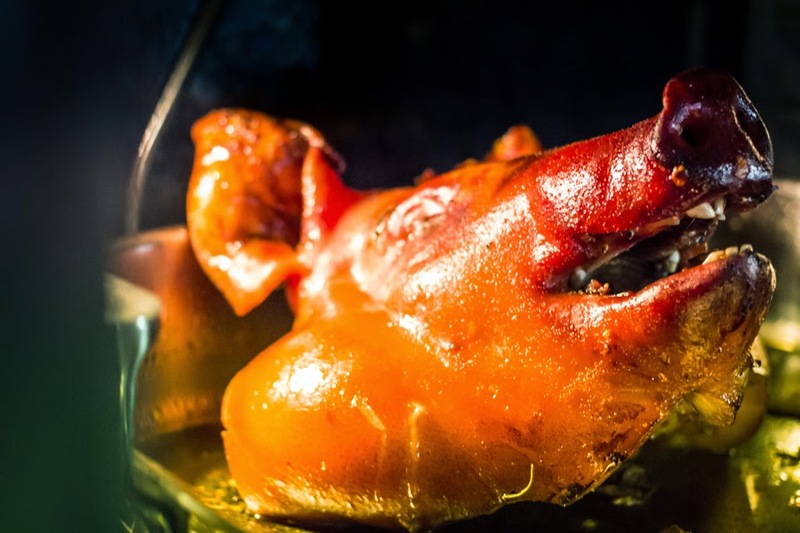 Seeing the recipe for Maple Glazed Pig's Head with Lobster in Martin Picard's book Sugar Shack Au Pied de Cochon, I had a immediate, intense, and extremely visceral reaction. It wasn't just a "hey, that looks good," it felt like a calling. The cookbook tells the story of the maple sugaring house that is an offshoot of Martin Picard's decorated Quebec restaurant, Au Pied de Cochon (The Pig's Foot). The Cabane à Sucre Au Pied de Cochon allows the chef to harvest his own sap, boil it into syrup, and then have a seasonal second restaurant that celebrates all things maple. The cook book celebrates a season at the shack, showing the sap turning to syrup, and then all the wonderful things you can do with it, from candies to drinks to savory dishes. I locked on to the one with the pig head. So while this sounds like a totally bizarre pairing, it makes a lot of sense considering Picard's Quebec-centric focus. He's very proud of the region's lobsters, pigs, and syrup, so why not work them all together? My dog wanted to play with these lobsters. After I committed to the recipe, all I needed was an event where I could serve this dish and not be inundated with tons of leftovers. Thankfully Carla's mom and brother were having a dual housewarming party, which would provide enough brave and curious appetites to give this dish a try. Suckling Pig Head: Prepped for Roasting. The recipe itself was very straight-forward, once I sourced the skin-on suckling pig head as a special order through D'artagnan. From there, it was mostly assembling and basting. Lots and lots of basting of the roasting pig head. 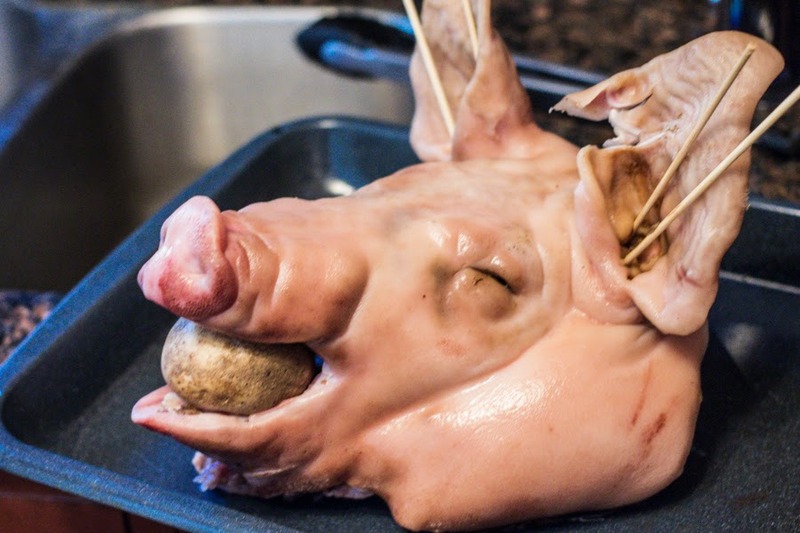 To start, I brined the head in saltwater overnight to remove excess blood and permeate the thick and knobby parts of the pork noggin with salt. The next morning the head was rinsed off and loaded into a large roasting pan with four cups of syrup, twelve cups pork stock, and some stock vegetables. It slowly roasted at 300 F for the next four hours, with lots of basting of the gently reducing stock and syrup. While the head was roasting, I began to work on the lobsters, which are used for both presentation and spooning over the finished head. 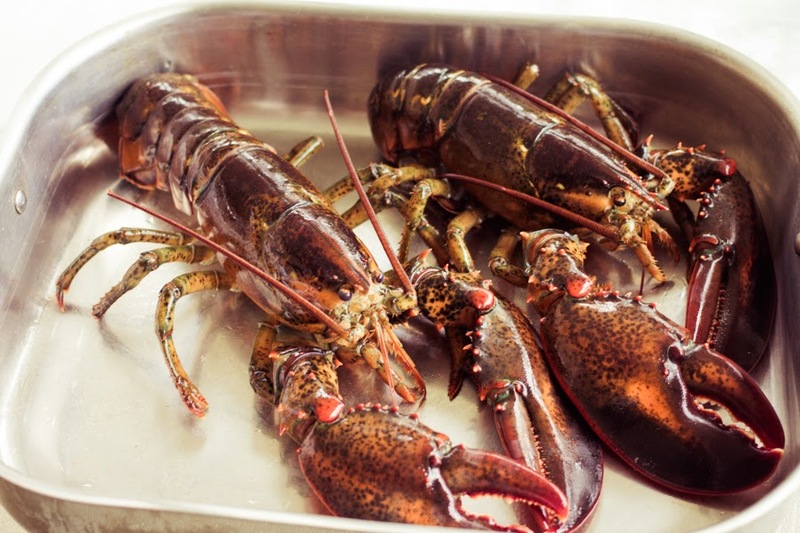 Teasingly, I told Carla I was more worried about cooking the lobsters than the pig head, as I'm pretty sure I've cooked more pig heads than lobsters in my life. But the lobsters turned out fine. A brief boil to just cook them through, then picking and poking out the lobster meat from the various crustacean crevices. Lobster meat successfully freed, I chopped up the shells (aside from the front half of one lobster needed as a "garnish") and made a lobster sauce with the shells, mirepoix, cognac, white wine, and more maple syrup. This simmered gently for an hour, all the while I kept basting and basting away at the head. Finally, with the end in sight, I prepped a healthy serving of mashed potatoes to serve as the bed for the pig head. Plus the potatoes are perfect for collecting all the drippings of sauce, pork, and lobster. 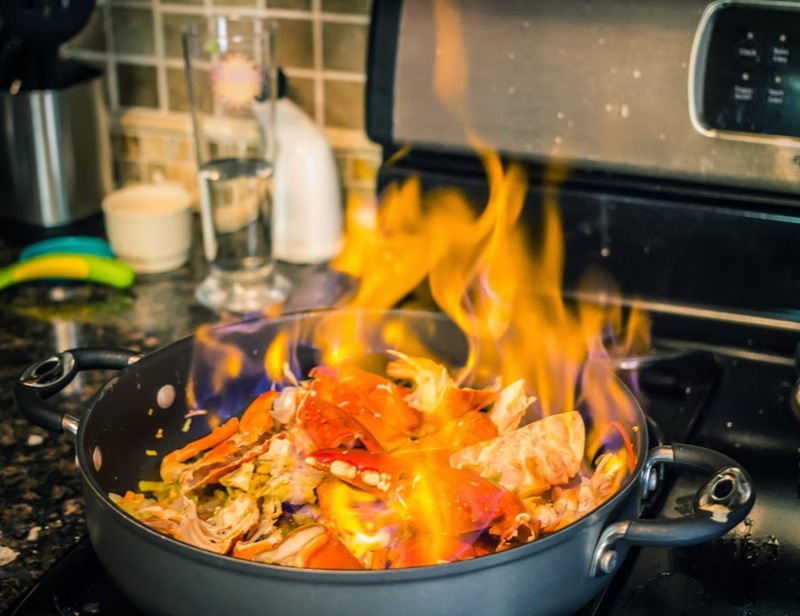 For serving, the remaining sauce from the pig head was taken out, mixed with the lobster sauce, and everything was strained into a fresh pan to reduce. The pig head stayed in the oven for another 30 minutes, which was cranked up to 400 F to help it brown and crisp up the skin. Using my largest serving platter, I laid down a pillowy bed of mashed potatoes, gently nestled the head into the potatoes, and then worked the front half of the lobster into the pig's mouth. It's a little harder than the old apple in the pig's mouth, but I eventually got it to fit. Finally, my favorite part of Picard's dish, I put the pig's tongue into the lobster claw. 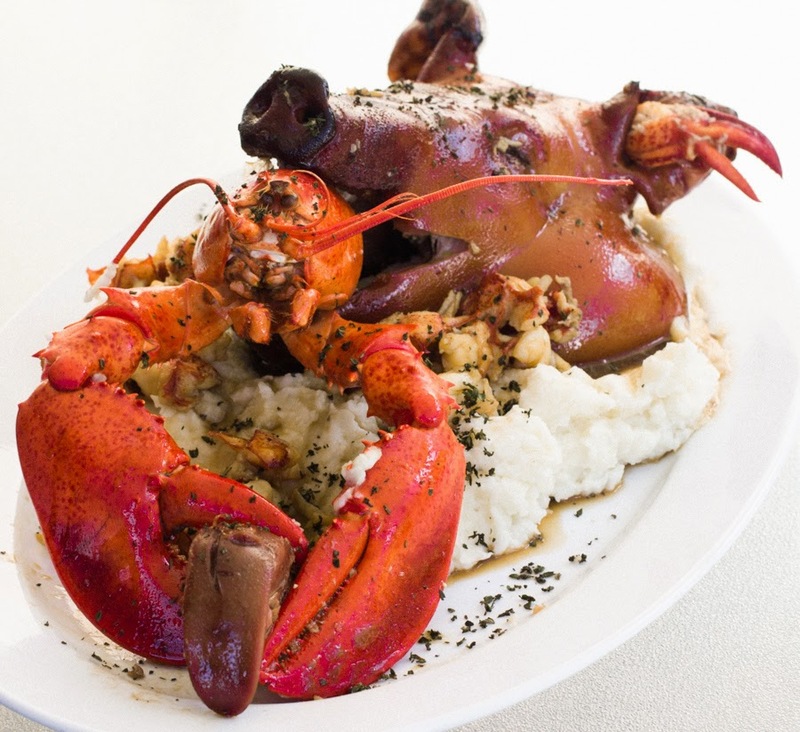 The reserved lobster meat was rewarmed in the sauce and generously poured over the pig, lobster, and potatoes. Verdict? Really good. Ever had a bacon-wrapped scallop? That's what this reminded me of, although I don't think it does the dish justice. Sweet lobster, sweet pork, sweet maple....but balanced with savory notes from the roasting process and the lobster sauce. But then again, it's hard to use the word "balanced" in a dish this gonzo and over-the-top. It was hearty, fun, and I'd make this dish again just to have those crispy ears; they shattered like maple pork brittle with each bite. We made a good dent in stripping the pig head down to the bone that day. What was leftover Matt boiled with the skull to make head cheese, which thrilled me to see it all go to use. 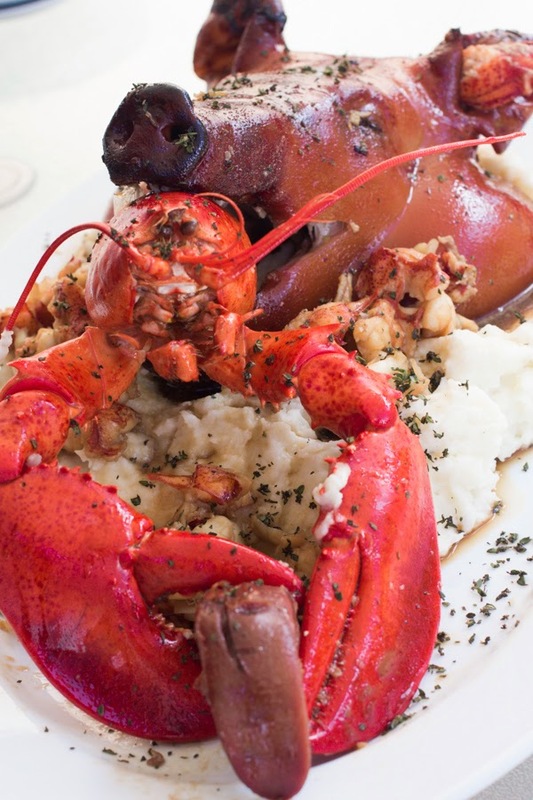 Funny enough, when looking up this dish, I came across Dana Goodyear's New Yorker review of the cookbook, in which she asks, "There is maple pig’s head and lobster (tell me: Who is making this at home?)"